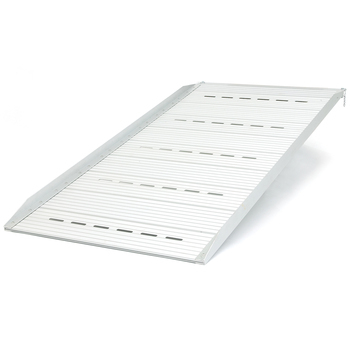 The New Pride Silver Star Solid Ramps provide excellent long-term access for mobility devices. The lightweight design and durability the solid ramps can be used in a variety of environments. They feature side rails for added safety and have 2 different surface areas to choose from, grip tape for better traction control or slotted for moisture drainage. The Pride Silver Star Solid Ramps are built to last and available in: 1.5’, 2’, 3’, 4’, and 5’ lengths. 1 1/2' Product Weight: 10 lbs. 3' Product Weight: 18 lbs. 4' Product Weight: 24 lbs. 5' Product Weight: 29 lbs. Product Weight: 10 to 29 lbs.